The Chase Sapphire Preferred card is almost universally considered the top travel rewards credit card currently offered. It’s also one of the few credit cards that earns the extremely valuable, and flexible, Ultimate Rewards points. In my review of the Chase Freedom card, I referenced the need to have a premium Ultimate Rewards earning card from Chase to be able to utilize the points option, rather than cash back, on Freedom spending. The Sapphire Preferred is that premium card, or key if you will, that will unlock those Freedom points to be able to transfer to travel partners. Which is just one of the many benefits associated with the Sapphire Preferred card. Let’s take a more in-depth look at the current Sapphire Preferred sign-up offer and the card’s numerous ongoing benefits. The Sapphire Preferred is currently offering 50,000 Ultimate Rewards points after spending $4,000 on purchases in the first 3 months from account opening. If you add an authorized user to your account, and that person makes just one purchase during that first 3-month period, you’ll earn an extra 5,000 Ultimate Rewards points. That’s a total of 55,000 Ultimate Rewards points once all requirements are met. The Sapphire Preferred credit card has a $95 annual fee, but the fee is waived the first year, making all your bonus spend and benefits gratis that first twelve months. The Sapphire Preferred card earns 2 Ultimate Rewards points per dollar spent on dining and travel purchases, and 1 Ultimate Reward point for all other spending. As you can see, if you’re a frequent traveler, especially if your employer reimburses you for airline/hotel/incidental expenses, this card can really rack up the points. The travel category includes: airlines, hotels, motels, timeshares, campgrounds, car rental agencies, cruise lines, travel agencies, discount travel sites, operators of passenger trains, buses, taxis, limos, ferrys, tolls, bridges, highways, and parking lots and garages. The travel category covers a large swath of travel related options, so earning 2x points can be fairly easy. The dining category is equally as generous, including the obvious sit-down restaurants and fast-food/fast-casual establishments, but you’ll find locations such as Starbucks, bars that don’t serve food and even caterers earning those 2x points as well. The latter category was an interesting find. Imagine placing a catering order for a large event and finding that the significantly priced purchase earned 2x points. Outside of the points earning power of the Sapphire Preferred, the card has other benefits that make it a keeper as well. It includes primary (not secondary) Collision Damage Waiver insurance coverage on rental cars, trip cancellation/interruption insurance and lost luggage reimbursement. It also has no foreign transaction fees, it’s chip-enabled and provides extended warranty and purchase protection insurance. 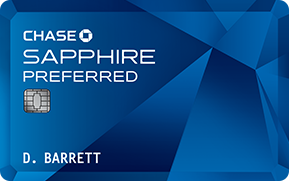 Make no mistake, the Sapphire Preferred is considered a premium credit card, and it has the associated benefits to prove it. In my opinion, Ultimate Rewards points are the most versatile, and valuable, travel rewards points available. The fact that the Sapphire Preferred earns 2x Ultimate Rewards points on a wide range of spending (and opens up the Freedom credit card earned 5x Ultimate Rewards points) is, for me, the primary reason for keeping/using the card. With the Sapphire Preferred card, you will be able to transfer Ultimate Rewards points at a 1:1 ratio to a number of airline and hotel partners. Airlines: United, Southwest Airlines, Virgin Atlantic, British Airways, Korean Air and Singapore Airlines. Hotels: Hyatt, IHG, Marriott and Ritz-Carlton. Points transfer in 1,000-point increments. With just the Sapphire Preferred sign-up bonus, you’d be able to transfer the 50,000 Ultimate Rewards points to United Airlines and redeem those United miles for 2 free roundtrip economy class tickets to/from any location within the continental U.S.
Or you could use the 50,000 Ultimate Rewards points to transfer to Hyatt Hotels and stay 2 nights, completely free, at the Grand Hyatt Kauai Resort and Spa or the Hyatt Times Square New York to name just two. If you prefer to stretch your points for more modest accommodations, you could easily get 6-7 nights at a Hyatt Place or Hyatt House hotel with that 50,000 point sign-up bonus. As you can see, Ultimate Rewards points open a vast array of free or reduced price travel options that can be used to make your travel dreams come true. And, as I alluded to earlier in this post, the Sapphire Preferred and the Freedom card are an incredibly powerful points earning combo. Coupling the everyday bonused spend categories of the Sapphire Preferred with the 5x quarterly bonus categories of the Freedom card can earn a large number of Ultimate Rewards points each and every year. Points that can be used to travel how you want, when you want. Now that’s a proposition that just can’t be beat. Not that this is a reason to choose a credit card, but the Sapphire Preferred is an extremely distinctive card that will draw the attention of those who handle it. The card is a heavy grade metallic, giving it a heft that few credit cards have. Owing to this weight, the card is thicker than a normal card, and its numbers are etched on its back, rather than the front, like you’ll find on an ordinary credit card. It’s not uncommon for clerks to give it a second look when it’s handed over, inquiring what kind of card it actually is. Chase has recently become a bit more restrictive with its credit card approvals. Ultimate Rewards earning cards, like the Sapphire Preferred and Freedom reportedly have fallen under the unwritten 5/24 rule. The 5/24 rule refers to applicants who have received 5 new credit cards from any credit card issuer (which may include being added as an authorized user on another’s credit card) within the last 24 months likely will not be approved for a new Ultimate Rewards earning card. It has also been reported that in the next few months, this 5/24 restriction will apply to applications for all Chase credit cards, not just the Ultimate Rewards earning cards. As noted, this is not a written rule from Chase, but there have been reports of applicants receiving denial letters with the 5/24 rule being noted as the reason for being denied. If you fall into the 5/24 category, weigh your options before applying for any Ultimate Rewards earning credit cards from Chase. The Chase Sapphire Preferred credit card ranks at the top of the travel rewards cards’ rankings. It can be argued that a few other travel rewards cards deserve top billing, but that’s an argument for a later date. If you’re looking for a rewards card that will give you bonused spending in travel related categories in addition to providing you flexible points that can be redeemed at top-notch travel providers, look no further. And when you factor in its symbiotic relationship with the Chase Freedom credit card, it’s hard to not add both the Freedom and the Sapphire Preferred to your credit card holdings.